I would have to say the story of my success in the 2018 Kentucky deer season has to date back to September 29th of 2017. On that date, I was fortunate enough to take a Boone and Crockett class Kentucky buck. Once the word got out about the deer I killed in 2017, my social media went kind of crazy. One day, while roaming through Facebook, I noticed I had a random message from someone in my area. He asked questions and persistently talked about my 2017 buck. I kind of blew it off at first, because when it comes to hunting, I usually keep my stuff mainly a secret. But, one thing led to another, and we talked a little here and there. One day I was at the local archery shop just hanging out, and in came this same guy. So, we finally met face-to-face and began to develop a friendship. His name is Kyle Groce. He is a bit younger than me, but we both share a passion for deer hunting. As the winter progressed, he learned that I do a lot of food plotting. He wanted to develop his hunting property into a sanctuary so that the deer don’t have to travel to get what they want. In mid-April he offered to let me hunt this same land if I would do the food plots for him. I knew the area, so I agreed without hesitation. In May, the weather finally cooperated so hat I could get started on the plots I agree to cut, till and sow. I began the process of bush hogging. While cutting a plot, this buck comes out and watched me like he was in awe that someone was there doing something. At the first look, I realized he was going to be a good buck worth chasing once the early seaons came. So, after hours of studying maps of the land, and once the food plots were finished, I eased my way back into the woods where I thought this buck was coming from. I took my minerals and my trail camera and got things set up where I wanted, and where I thought I might have a great chance to ambush this buck once the season began. The very first day the camera was there, I got pics of this buck. Immediately my focus was on this one particular animal. As part of my permission to hunt the land, I was free to do as I please. So, I kept this buck a secret, as I thought he’d go 160 plus inches. Kyle and I became great friends and spent all summer locating more deer for him to get set up on to hunt. September 1st finally arrived and Kyle and I already had our game plans set in stone. He was getting some good deer on camera, and I was getting my buck in two different locations during the daylight hours. On opening day, I got in the stand around 5 o’clock AM, fearing that I might bump this big boy going in. That first morning came and went. I saw a lot of deer and some small bucks, but not the big Kentucky buck I was after. Of course, early September in Kentucky its pretty warm… like, 90 degrees warm! So, I got out of my stand and headed home. There was no way I was staying all day in the stand in that heat. Around 3:30 that afternoon, I started to get ready to head back to the stand. I showered, gathered my equipment and headed that way. I got in the stand around 4:30 and got things set up, and instantly I had action. A mature doe and her fawn came in and stayed in my area for about 30 or so minutes, so I was upbeat and positive. Deer came and went all evening, both bucks and does. Around 7:15, I saw a nice buck working toward my location and instantly knew it was a great 8 point. I had guessed he was about 140″ or so. Right behind him I saw the big 12-point I had been watching all summer. Both bucks came in on a string to 19 yards. But, the big mature buck was no dummy. He stayed right behind the 8-point the whole time, and I couldn’t get a shot at him. All I could do was sit and watch him walk away. Day two was much of the same. There was a lot of deer activity, but no shooters. Kyle, however, did fill his tag on that second day with a real nice 8-point that was on his hit list. I hunted hard over the next week, and saw the big 8 on multiple occasions, but he never had the buck with him I was looking for. I even had him within 30 yards of me for 29 minutes one morning, but I still let him go. On Wednesday, September the 12th, I had decided to hunt, but I was going to change things up and head to a blind at the edge of a food plot. Once I got to the farm, I realized the wind was totally wrong for that location and went right back to my stand where I had the earlier encounter. The wind wasn’t totally right for me, but it wasn’t totally wrong either. I was on a ridge, so I knew my scent would blow above anything that came in. Around 5:30 I had a small buck come in, and it brightened my outlook somewhat. That buck left and a doe and fawn came in. They stuck around for 20 or so minutes, but then wandered off into the thick brush. At around 6:30 a small really good up and comer buck came in. I had seen this deer many times, and he was always with more deer and never alone, so I focused hard on the direction he had came from. About 3 minutes later, I could see the big 8 coming, and this time he was out of velvet, and looked bigger than I had thought. As he was walking up the hill, he kept looking over his shoulder to check something behind him. One of my deer hunting tips is, when a mature buck is watching behind him, it only tells me that something bigger may be lurking. Well in this case, there was. Coming straight at me was the buck I was after. He came in just like I had planned, but I didn’t plan on the other two bucks being there with him. For nine minutes I had to watch him and the other bucks mill around and feed. Finally, the big 8 swung around to the back side of the 12. I had been waiting on this, because I knew it would turn the 12 where I could get a shot off. He turned around to chase the 8 and gave me the quartering away shot I needed. I let my arrow fly and instantly knew I had fatally hit him. The angle he gave me was a little steeper than I had hoped for, but I was super confident in my shot. I immediately called my wife, and then Kyle, to tell them I had shot. Kyle and another good friend, Nick McWhorter, had begged me all summer to film my hunts, and I had blown them off until about 2 weeks before season. They got me set up, and ready to film for this season. Well, knowing the deer had my arrow, I chose to not even attempt to look for anything until I got to see my footage to confirm my shot placement. I met Kyle at my truck, and we reviewed everything together. In our opinion, that shot had been perfect. By this time, my wife and son had shown up, and were excited to start tracking. We headed back to my stand and began to look, but there was nothing to find. No blood, no arrow, no nothing. I knew which way he had ran, so we started in that general direction first. Travis, another buddy had came to help track and to get him out of the woods. Travis saw my Nockturnal lighted nock glowing bright, so we headed straight for it. There he laid; the buck I had studied all summer in hopes for one chance. I got it, and the shot was perfect. I ran my arrow and broadhead from in front of his back left hip, all the way up to his front right shoulder, just like I had intended. Just like that, it was all over. He ended up being a mainframe 10, with two abnormals on his left side. He scored 155 inches. I was tickled to death. I have been blessed to take some nice bucks, and it drives my addiction to the outdoors even greater! So not only did I kill a great Kentucky buck, but I also made a life-long friend in the process. That’s what hunting and the outdoors is all about. There’s nothing like the adrenaline rush of being in close to a deer or other wild game and releasing an arrow that finds its mark. But, what if you’ve never felt that rush? What should you know to begin the quest of being a successful bow hunter? In this article we will do our best to get you started in the right direction. Let’s just call this N1 Outdoors’ Bow Hunting For Beginners 101. So, What Brings You To Bow Hunting? Maybe you’ve always hunted with a rifle or other firearm. Maybe you’ve mastered gun hunting and simply want to try your hand at a new challenge. Or, maybe you’re totally new to any type of hunting and just want to learn what this bow hunting thing is all about. Whatever your situation or age, we think you’ll find that bow hunting is not only fun (you’ll want to say “Bowhunt Oh Yeah!”), but helps teach patience, discipline, attention to detail and focus. And, there is certainly a special sense of accomplishment knowing you have been able to take an animal at close range and provide meat for your family and friends. If you haven’t taken your state’s hunter safety course, be sure to sign up and do that the first chance you get. This will help you learn safe hunting practices whether you are hunting with a bow or a gun. You will also learn the hunting laws and regulations of your state as well as learn how to identify game. It’s possible that if you’re interested in learning to bow hunt, that you’ve already been watching videos or TV programs about bow hunting. But, if not, there is certainly no shortage of videos about bow hunting tips. And, while videos are great visuals to learn from, don’t discount the wealth of knowledge you can glean from bow hunting blogs and articles. You may also find it interesting to learn about the history of archery as well. It may help you appreciate the skill you are about to begin learning. Your local bow shop is a great resource for anyone wanting to begin their bow hunting journey. You don’t have to look long on social media to know that there are more than a few companies pushing their archery equipment and supplies. Of course, they all look good and sometimes it’s difficult to know what exactly you need. Broadheads And Arrows And Bows, Oh My! As a bow hunting beginner, you may be overwhelmed with the choices of bow hunting equipment that is currently on the market. Your local bow shop can help you find your way through the sea of bow hunting advertisements to equipment that’s right for you. For example, what is your draw length? What should the poundage be on your bow? And, of course, there are so many choices when it comes to broadheads, arrows, arrow rests, sights, releases, bow strings, fletches and targets. And, of course, these things can be affected by what species of game you will be pursuing. The bottom line is that your local bow shop should provide you with a wealth of information when it comes to figuring out your equipment needs. And, of course, it’s always great to support local business, right? Once you have decided on and purchased your bow hunting equipment and supplies, it’s time to do some target practice! But, before you sling an arrow, you need to inspect your equipment. Be sure you don’t have any cracks in your bow limbs, fraying of your bow string, or nicks or cuts in you bow cams. Also, be sure you have waxed your bow string recently. You may have a local range or archery shop to shoot at, but you may also choose to buy your own target for practice at home. If you choose to shoot at home, always be sure you set up your target in a safe location where there is no chance of an arrow shooting toward any individual. This includes never shooting towards houses, streets, sidewalks or any other location where people may be standing or passing by. It’s also a good idea to place a backstop of some kind behind your target. This will help to block an errant arrows that miss the target. Be sure your backstop is much larger than your target. Once you have set up a safe target location and inspected your equipment, you are ready to begin practicing! Be sure you don’t nock an arrow until you’re ready to shoot. When you nock your arrow, be sure to point it toward the ground while nocking. In short, never point the arrow at anything you are not prepared to draw on and shoot. Also, if possible try to be shooting toward your target at a downward angle. Once you have gotten familiar with the operation of your new bow hunting equipment by shooting at a target, you can start to prepare for various bow hunting scenarios. While shooting at a stationary target is certainly something to master, deer and other game animals don’t always still and broadside, allowing you to take a perfect shot. So, you should practice shooting your bow from various positions, including inclines, declines and sitting positions. You should also practice shooting in a way that mirrors the various angles that your game may be standing. For example, a shot on an animal that is quartering away from you will require you to shoot further back, so that the arrow passes through the vitals, so that you can take an ethical shot that results in as clean a kill as possible. You may already be a hunter that is learning to bow hunt. But, if this will be your first hunting trip, be sure before you get your hunting license before your first trip. You can contact your state’s Department of Natural Resources to purchase a license. Some local outdoors shops also sell hunting and fishing licenses. You can also go online to purchase a license for the state you live in. As you get ready to take your new bow hunting skills to the field or the woods, continue learning as much as you can from experienced bow hunters. Be teachable. Your learning curve will be much less steep if you listen well and put into practice what you’ve learned. You may feel that learning the basics of shooting your bow will surely lead to instant success. We certainly wish you bow hunting success. However, there is much to learn when trying to take an animal with a bow at close range. For example, you must pay close attention to wind direction as well as learn when to use certain entry and exit routes to access your deer stand. And remember, even after your hunts, be sure to continue educating yourself on hunting tips with relevant blogs and videos. Hopefully this bow hunting for beginners article has provided you with the information you need to get started on this new adventure! We wish you success and hope you have an arrow that’s Just Pass’N Through! Hunting is not only fun, it’s fulfilling to be able to provide meat for your family and loved ones. However, taking the animal should not be the only goal. A hunter should always make every effort to kill the animal with a single shot, one that results in as quick a demise as possible. So, how can you know where to shoot a deer so that you can accomplish this? Well, a hunter needs to be well-versed in deer anatomy, so that the animal can be taken with as little suffering as possible. The definition of what an “ethical shot” is when hunting deer has been an oft debated topic. Whatever your definition may be, a shot that presents the opportunity for the quickest and most humane (and legal) kill should be utilized. It’s easy for excitement to give way to poor shot selection when hunting. Unfortunately, this often leads to the wounding of an animal, resulting in unnecessary suffering. The following are locations of a deer’s anatomy, that if properly executed, will result in an effective kill. Simply put, a heart shot on a deer is lethal. However, while it will result in the death of a whitetail, it does not necessarily always provide the best blood trails. When the heart is hit, the flow of blood decreases and may result in less of a blood trail than you were hoping for. A bullet or broadhead that penetrates the heart often pierces the lungs as well, which is beneficial to ensuring a quick recovery of the animal. When taking a heart shot, it’s good to be sure that the caliber of bullet you are using is sufficient to penetrate the shoulder blade and ensure a clean kill. The downside to a larger bullet is it can result in a larger amount of unusable meat upon processing. The lungs provide a large target for rifle hunters and bowhunters alike. While a bullet can enter the lungs of a deer and exit, shooting its lungs with a broadhead will make it difficult for the deer to breathe. Usually, that difficulty breathing will keep it from being able to run too far after the shot. Sometimes, however, simply clipping a lung or not having a complete pass-through shot can result in poor blood trails, making the deer more difficult to track. A lung shot with a bow is often as effective as a heart shot. Just aim for the middle of the lung area. A well-placed lung shot will cause the deer to suffocate to death. However, a lung-shot attempt that hits too far back may only pierce the liver, which can result in a much slower death and more difficult to track animal. You can drop a deer with one shot if the spinal cord is severed. A neck shot that severs the arteries in the large arteries in the neck can be particularly bloody and lethal. But, while a lethal neck shot causes little damage to the meat of the animal, if the spine is not severed, it could be difficult to recover and it may even survive. While a neck shot can be a risky shot with a gun, it’s simply a very poor shot to take if you’re a bowhunter. If it is well executed, a brain shot will drop a deer immediately. When you put a bullet through the brain, it will disrupt the life functions of the deer and it will lose consciousness immediately. This shot results in no loss of meat, but is a very difficult shot to make, due to the small target area. If the shot is not accurate, it can result in unnecessary suffering of the deer and you may not be able to recover the animal. While we’ve covered various parts of a whitetail’s anatomy that can be aimed for during a hunt to result in a kill, it’s also good to be well-versed in the rest of a deer’s anatomy, so you can become a more well-rounded and knowledgeable hunter. All deer species have a four-chamber stomach. The four chambers are called the rumen, reticulum, omasum and abomasum. Deer are able to consume large amounts of food in a relatively short period of time. That food is swallowed and passed to the first stomach, which is known as the rumen. The digestive bacteria in the rumen begins to break down the cellulose found in the plant life that the deer has consumed. However, the rumen cannot completely break down and absorb all the necessary nutrients, so the deer will regurgitate the food later and chew it again. This is often referred to as the deer “chewing its cud.” This allows the deer to further break down the food, so it can absorb the nutrients it needs. After a period of about 16 hours, the food will pass from the reticulum to the omasum. In the omasum, the water from the food is absorbed. The food then passes to the abomasum, which produces acid that further breaks down the food that the deer has eaten. 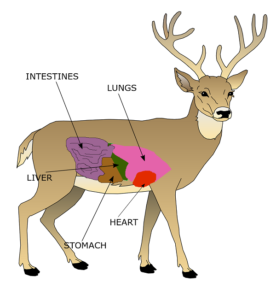 After leaving the abomasum, the remaining food particles and liquid are passed to the deer’s intestines, where it will eventually exit the body as feces and urine. Whitetail typically defacate an average of 13 times per day. It’s sometimes hard to believe how a whitetail’s skinny legs can produce so much speed and power. While they cannot maintain top speed for long distances, they can run up to 40 miles per hour in short bursts. With the use of their hooves, they are able to make sharp turns and pivots, even at high speeds. Their hind legs provide the power for their speed and jumping ability. In fact, deer are also good swimmers. Male deer have antlers on top of their head as part of their anatomy. Although rare, it is also possible for a doe to grow antlers occasionally. A whitetail’s antlers are actually live tissue that are composed of bone. A deer’s antlers hold the distinction of having the fastest growing tissue of all animals. Whitetails begin growing their antlers in the Spring and they can grow at an average rate of up to two inches per week! During development, the antlers are covered with a spongy tissue called velvet. The velvet contains blood vessels that generate growth of the antlers. Antler growth typically stops in late Summer to early Fall. Once growth stops, the deer will remove the velvet from their antlers by rubbing them on the bases of trees. After the breeding season ends, bucks will shed their antlers. Shed times can vary in different parts of the country, but typically take place between January and March. A deer has hearing that is far superior to human hearing. This serves a whitetail well in identifying danger in the form of humans and other predators. Muscles attached to the whitetail’s ears allow it to rotate them and hear in multiple directions without having to move its head. This helps it to determine which direction the sound or is coming from and possibly even how far away the sound is. This part of a deer’s anatomy plays a critical role in its survival. You may have heard the saying that someone has “eyes in the back of their head.” A deer of course does not have those, but because its eyes’ location on the sides of its head, it does in fact, have a 310-degree field of vision. Almost as good as eyes in the back of the head! Although it is hard for deer to focus on one object, their excellent vision helps them see clearly in the night-time hours. A whitetail’s excellent sense of smell is one of its best defense mechanisms. A deer will lick its nose to make it moist. This allows it to “capture” odor particles that are carried by the wind and that stick to the deer’s nose. This not only helps a deer identify danger, but also plays a huge part in the breeding process. Both male and female deer leave scent behind via urine and various scent glands. Among other things, a whitetail’s incredible sense of smell allows a buck to know when a doe is ready to breed, or when an intruder buck is in the area. It’s very important to not only be familiar with deer anatomy as a hunter, it’s just as important to know what your limitations are with the weapon you are hunting with. Is the weapon going to be effective in producing a clean kill? Is your skill level such that you can safely and accurately make an ethical shot? Practice. Practice. And practice! If you pair knowledge of deer anatomy with skill and patience, success is on the horizon!